The Chargers Football Club formed the first atom team in the City of Edmonton in 1994. They participated in the St. Albert and District Minor Football League. Ken Dollmont moved out of the equipment room to become the first head coach. The 1994 season was not a typical year for a rookie team. The Chargers Atom team finished in third place and ended up as St. Alberta and District Minor Football League Tier II Champions. In 1995, the Atom team finished fourth overall and lost in the League Championship game. In 1996, the Chargers Atom team finished first overall in the new Capital District Minor Football Association Atom Division. There was now competition from Spruce Grove and Stony Plain. They only lost one game all season until the Atom Division Championship which they lost to the St. Albert Redskins. The Chargers Atom Football team finished first overall in 1997, in the Atom Division that now included the Sherwood Park Association. They did not lose a game until the Atom Championship (which was also the Provincial Championship). The Atom team had another successful regular season in 1998 with only one loss. Once again they finished in first place overall but lost out in the Atom Championship game. The 1999 season resulted in no regular season losses and another first place finish, but unfortunately they lost early in post season play. 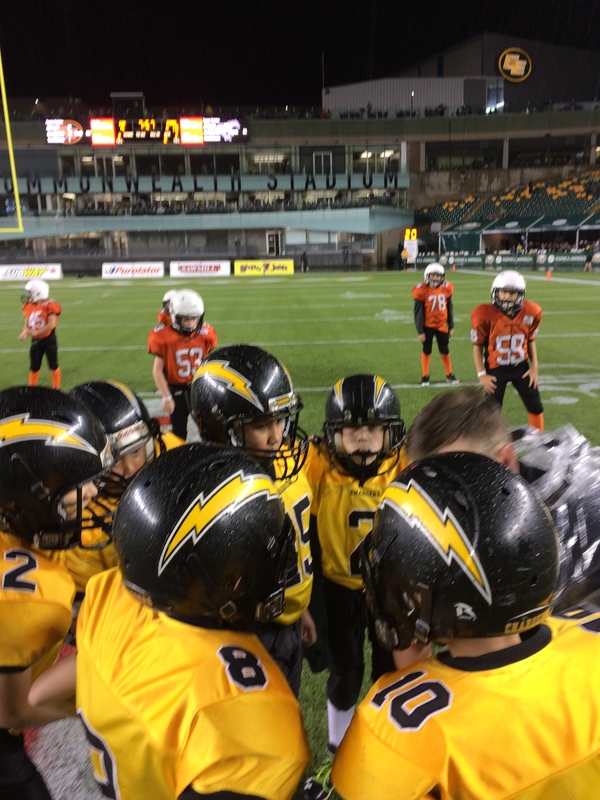 The Chargers Atom team was once again the only undefeated team in the Atom Division of the Capital District Minor Football Association in 2000. The play off games were very exciting and the team finally won the Football Alberta Atom Provincial Championship. The 2001 year was the end of an era, with Ken Dollmont coaching his final year. The team had lots of rebuilding to do and finished out of the playoffs for the first time ever. Chetan Gosavi took over as head coach of the Atom team in 2002. The team spent lots of time learning football skills and had a ton of fun. They were successful in becoming the CDMFA Tier III Champions. In 2003, Mel Parcels became the head coach of the Chargers Atom team. The team was very young and so were the coaches. It was a year of growth for everyone. The Atom team was stronger in 2004, with lots of returning players. They had some wonderful games with lots of skill development during the year. The 2005 Atom team only had 3 players returning from the previous year with a large number of children moving up to the Peewee team. There were many new players who had lots of fun on and off the football field. The Atom team had 17 experienced players in 2006. With this extra knowledge, the team went all the way to the second round of the playoffs.